One of the best ways to attract a visitor and convert him/her into a buyer or subscriber is to make him/her an offer. Most important, the offer should be conspicuous, vivid and attractive enough to make a visitor want to at least consider it. You should do it by not leaving your potential subscriber a choice but to see it. How can you do that? Create and incorporate any number of exit-intent popup offers. Customize your popup windows and make them more attractive. Use a variety of templates. Regulate the interval, at which Closing (x) is displayed. Tailor your popups to mobile devices. Apply different targeting options, including geo-targeting. To set Popup on Exit you need to have the PRO version of our plugin. 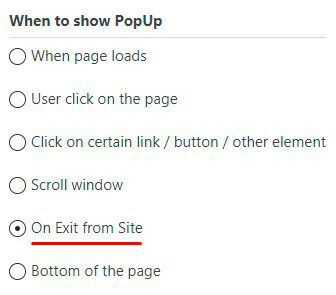 Install it and in the Main tab of your Popup settings – you will see “On Exit from Site” option. Do not forget that you need to insert the shortcode into the page, where you want to see the Popup. The benefit of our plugin is that you can choose any template you want! You can set the Exit Intent Popup plugin up to target social network audiences by addressing targeted messages to these audiences. This strategy results in high visitor-to-customer conversion rates. This technique has proven right for promoting contests and/or events (concerts, exhibitions, parties, festivals, etc., and increase ticket sales overnight. All you need to do is set up the plugin and shape your Popup.